Cervical hypolordosis describes a deficient front-to-back spinal curvature in the neck. Hypolordotic cervical curvatures are also known as military neck or straight neck syndromes and are often blamed for causing neck pain symptoms. Hypolordosis is extremely common in the neck, especially in older patients who have suffered the usual varieties of spinal degeneration that tend to act on the normal cervical lordotic curvature. In some cases, lordotic loss may be the actual source of pain, while in other scenarios, the loss of lordosis might actually be a result of another painful process. A great number of hypolordosis conditions are incidental to any symptoms experienced, not being the cause or result, but just innocuous findings visualized on diagnostic imaging studies. This guide discusses the common loss of cervical curvature that is medically diagnosed as hypolordosis. We will look at the causes of lordotic loss, as well as detail the effects of this marked change in the upper spinal anatomy. Lordotic changes come in 2 distinct varieties: those that are skeletal in nature and those that are the results of muscular issues. Cervical skeletal hypolordosis can be created by a great number of possible abnormalities of the spine including intervertebral disc pathologies, vertebral degeneration, scoliotic curvature of the cervical spine, fracture of cervical vertebrae and cervical spondylolisthesis. All of these structural concerns can lead to changes in the cervical spinal anatomy that might result in decreased front-to-back curvature of the C spine. In cases of skeletal hypolordosis, there is a chance that the loss of curvature is indeed a primary cause of pain, although many cases are completely innocent of creating any symptomatic activity. Just to be clear, losing some degree of cervical lordosis is normal as one gets older, so most mild to moderate cases should not be symptomatic. Cervical muscular-induced hypolordosis denotes a structurally-normal C-spine that is simply being pulled straight by muscular spasms in the tissues that help support and move the neck. There may be spinal irregularities present, but these have not resulted in any permanent changes to the cervical lordosis. Instead, chronically tensioned muscles are straightening the C spine, causing the perception of actual hypolordosis. In many of these cases, the surrounding musculature is in spasm due to pain from another anatomical, disease-related, systemic or mindbody origin. When this occurs, the altered lordosis might be the result of this painful subsequent muscular tightness, rather than the cause of pain, as is commonly mistakenly identified during diagnostic processing. The lordotic curvature in the cervical spine is naturally engineered to facilitate a complete range of movement for the head, reduce stress on the neck, absorb shock and balance the posture. When hypolordosis occurs, all of these positive design attributes of the neck begin to disappear, potentially causing significant problems for some patients. A straightened neck will certainly be more susceptible to trauma. There is no curvature to mitigate shock, so the spine absorbs the full force of every stress placed upon it. It is common for people with chronic hypolordosis to suffer increased deterioration of the cervical vertebral and intervertebral bodies, as well as marked degeneration of many of the cervical spinal joints. Greater susceptibility to fracture and spinal cord injury is evident in the worst cases of lordotic loss. Hypolordosis can play havoc with posture and has been implicated in causing many muscular problems, including imbalances, neck pain and tension headaches. Some people with severe loss or reversal of cervical lordosis might suffer reduced range of motion in the neck and head. Forcibly extending this range of motion might cause severe traumatic injury that may not affect people with a more typical and adequate spinal curvature profile. Extreme cases of lordotic loss and cervical kyphosis may result in central spinal stenosis or neuroforaminal stenosis in the neck. 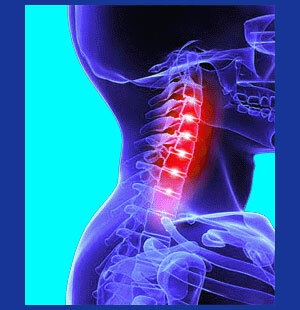 These conditions can compress the spinal cord or cause pinched nerve neck pain issues. The biggest problem that we have witnessed when it comes to the loss of cervical lordosis is the question of the condition being primary, as a causative mechanism for pain, versus the condition being secondary, as a direct result of pain. We have only seen a few cases where the primary lordotic loss was obvious and symptoms were directly related to highly case-specific anatomical issues created by severe skeletally-induced hypolordosis. The vast majority of cases we have seen mirror the secondary lordotic loss that usually seems to be caused by primary muscular tension, spasms and pain. Now, while this fact has not gone unnoticed by us at The Cure Back Pain Network, the logic of this conclusion does seem to have eluded many diagnosticians. So many patients have written to us complaining of pain due to hypolordosis in the neck, when it is painfully obvious that their conditions were the results of existing pain, rather than the cause. Diagnostic films show no evidence of spinal causation that would explain their lordotic loss. Meanwhile, physical exam showed extreme degrees of muscular tension and pain in areas that are responsible for the degree of curvature demonstrated. It shocks us that so many of these patients were told that the lordotic loss was responsible for their pain, instead of a result of their pain. If you have been diagnosed with cervical hypolordosis, be sure to read more about the condition and understand that pursuing primary treatment might be a complete waste of time. In cases of secondary hypolordosis, treating the symptom is sure to provide poor outcomes, since the underlying causative mechanism remains unidentified and untreated. This fact explains why so many patients who undergo spinal fusion to correct drastic lordotic loss suffer terrible postoperative pain, failed fusions and a wide range of complications. After all, the muscular process continues pulling on the spine postoperatively, so no cure can be provided. One of the major causes of muscular tensioning leading to a loss of lordosis in the neck is oxygen deprivation enacted by a mindbody syndrome. Be sure to account for this possibility in order to better your chances for effective treatment.